The second speaker stands in the middle of the reception tables. Night has fallen, now that the sun has set and the light of day has faded away. The beautiful lighting set up by Esperanza Resort casts a glow on the speaker’s face without washing it out. We love the effects of the lighting as it created shapes across the reception area. This black and white photograph portrays the intricate details of her dress, too. The speaker holds her handwritten speech in one hand and the microphone in the other. Everyone in the audience is moved by her heartfelt words. 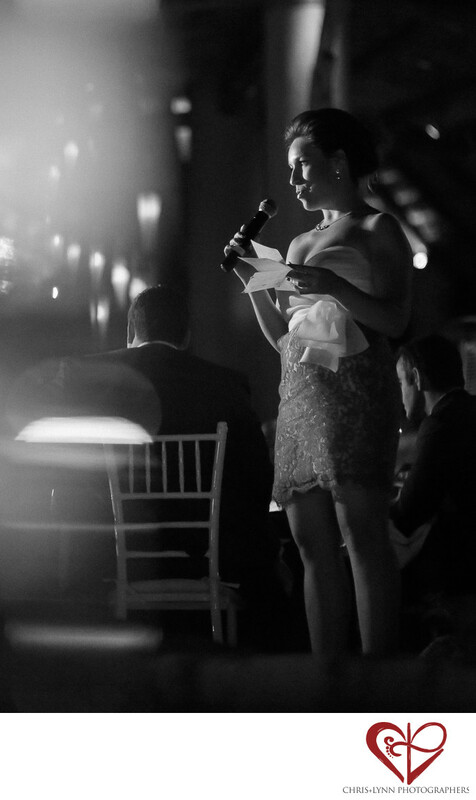 At their table, the bride and groom listen to the beautiful toast, captivated by her words. 1/400; f/1.8; ISO 6400; 85.0 mm.